At the 2013 AACR meeting, Stand Up to Cancer (SU2C) formally introduced its alliance with the St. Baldrick’s Foundation and announced the newest SU2C research Dream Team, targeting pediatric cancers. The Dream Team will receive a $14.5 million translational cancer research grant over four years and instruments donated by Life Technologies. Leading the new Dream Team are John Maris, M.D., director of the Center for Childhood Cancer Research at The Children’s Hospital of Philadelphia, and Crystal Mackall, M.D., chief of the Pediatric Oncology Branch of the National Cancer Institute. Thermo Scientific launched the second-generation Pierce G2 Fast Blotter for Western blotting applications and automated transfer of proteins as large as 300 KDa from up to four mini gels in parallel. The G2 blotter features an integrated high-current power supply and utilizes the company’s high ionic strength 1-step™ Transfer buffer system. EMD Millipore launched the Amicon® Pro purification system for protein purification in a single device. The device can be configured for different applications, including purification, depletion or enrichment, and diafiltration by modifying the resin used and protocol steps. EMD Millipore also featured its SmartFlare™ RNA detection probes. 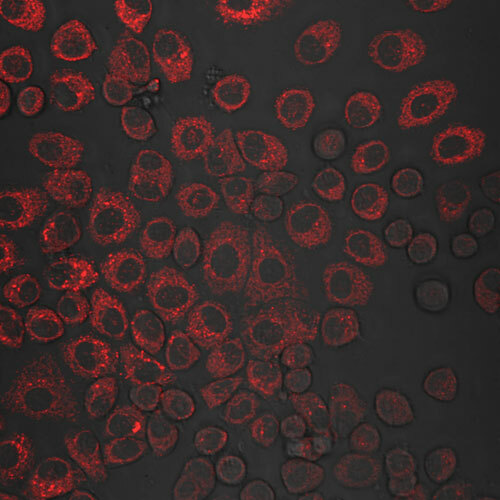 This nanoparticle-based technology detects native mRNA or miRNA in live cells in a nontoxic manner and without affecting gene expression or production of a protein of interest, so the cells can be reused downstream. In a multiplexed experimental design, SmartFlare probes can be used to sort different populations of cells based on RNA levels. Several posters displayed by Horizon Discovery highlighted the capabilities of its Genesis™ precision gene-editing technology. In one, Grooby et al., described an siRNA screen using a reporter cell line in which hypoxia-inducible factor 1 alpha (HIF1α) was terminally tagged with a NanoLuc™ luciferase. The Genesis platform uses recombinant adeno-associated viral (rAAV) vectors to achieve targeted gene editing by stimulating the homologous recombination DNA-repair pathway in human cells. The platform can be used to develop and validate cell lines for target identification and validation, and for assay development, disease modeling, and compound profiling. Active Motif, a provider of kits and reagents for epigenetics research, recently acquired SwitchGear Genomics, adding to its existing product line a host of research tools for studying regulatory elements in the human genome, including reporter assays. As digital imaging technology increasingly replaces film-based techniques, Li-Cor showcased the new C-DiGit™ Chemiluminescent Western Blot Scanner, which incorporates digital imaging technology to produce film-quality Western blot images. Peggy, the newest member of the ProteinSimple family of automated gel-free Western assay instruments, separates proteins by both size and charge. Beckman Coulter highlighted the Biomek 4000, featuring an optional enclosure and a new elevated deck design to facilitate integration of other devices such as plate readers. EMD Millipore reports that its SmartFlare RNA detection probes detect native mRNA or miRNA in live cells in a nontoxic manner without affecting gene expression or production of a protein of interest. Molecular Devices’ new SpectraMax® i3 multimode microplate reader platform features standard spectral absorbance, fluorescence, and luminescence detection capabilities. The modular design facilitates the addition of other detection capabilities and the option to add on the SpectraMax MiniMax™ Imaging Cytometer. Bio-Rad’s NGC™ chromatography system is a modular, readily expandable, and upgradable instrument that incorporates all of the necessary components in one unit, with magnetic surfaces throughout. The company’s configurator tool helps customers design a customized system to meet their application needs. The 404Pi™ phase-based surface plasmon resonance (SPR) instrument is the first product from BiOptix. Designed with an automated multi-injector (4 injectors/4 parallel flow cells) fluidics system to enable high-throughput, label-free kinetic measurements for molecular interaction analysis with high sensitivity, the instrument can measure protein-protein or protein-small molecule interactions. An agreement between Advanced Cell Diagnostics (ACD) and The Johns Hopkins University’s Sidney Kimmel Comprehensive Cancer Center centers on the use of the company’s RNAscope® digital pathology analysis software for detecting and quantifying RNA molecules in a cell. ACD and Definiens recently initiated an early access program for the RNAscope SpotStudio™ technology for quantitative in situ RNA biomarker analysis. EZ DNA Methylation™-Lightning kits from Zymo Research for bisulfite conversion of DNA for methylation analysis require only the addition of the Lightning Conversion Reagent to a 100 pg–2 µg DNA sample. Zymo also showcased its RNA Shield™ reagent, which lyses cells and stabilizes intact RNA, protecting it during transport or storage at ambient temperature. Norgen Biotek featured its Stool Nucleic Acid Collection and Transport Tube, which stabilizes DNA and RNA for transport at ambient temperature, and its Stool DNA Isolation kit for simultaneous isolation of bacterial and host DNA. When PerkinElmer launches its new RediFect lentiviral particles, customers will be able to use them to transfect their own cell lines with Redluc firefly luciferase and other bioluminescent and fluorescent reporters. The company’s new GFR-Vivo 680 imaging product is an inulin-based infrared fluorescent agent for obtaining noninvasive measurements of the glomerular filtration rate in vivo to assess animal models of kidney disease, dysfunction, and drug toxicity. It allows for kidney function assessment as part of drug safety studies performed early in drug discovery and makes it possible to assess the efficacy of a drug candidate and its potential for kidney toxicity in the same animal study. Ingenuity Systems featured the spring release of its flagship IPA software for analyzing and integration of omics data. New features include BioProfiler for identifying genes causally related to a disease or phenotype with the potential to be drug targets or targets for minimizing toxicity. IPA’s new Causal Network Analysis uses data on changes in gene expression to generate hypothetical regulatory networks that may have a role in a disease or phenotype of interest. 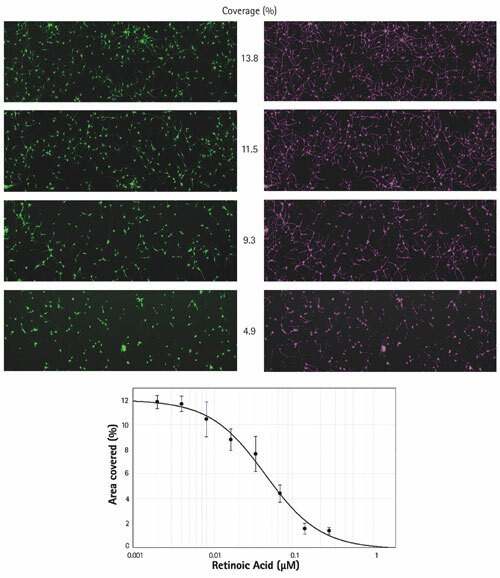 Dose-dependent inhibition of neurite out-growth assessed by the Molecular Devices’ SpectraMax MiniMax™ Imaging Cytometer. Top: As concentration of retinoic acid increases (top to bottom; top row: control), percent coverage of neurite outgrowths decreases. The purple mask (right column) identifies cell bodies and outgrowths. Bottom: Plot of the masked area as a function of retinoic acid concentration, produced by SoftMax® Pro Software.